Chart showing $ amounts and # of players expected to be compensated by settlement. Much has been written about the settlement to the NFL concussion litigation. The recently released actuarial data however lends considerable insight into more accurately evaluating the quality of the settlement. Although media stories on the quality settlement have varied widely, according to the report handed into the court, the actual number of players expected to be compensated is rather high. The NFL Concussion Liability Forecast prepared for the plaintiffs by Dr. Thomas Vasquez of the Analysis, Research, Planning Corporation forecasts that nearly 3,600 former players will receive compensation over the life of the settlement. The average amount of their compensation will be $259,000. 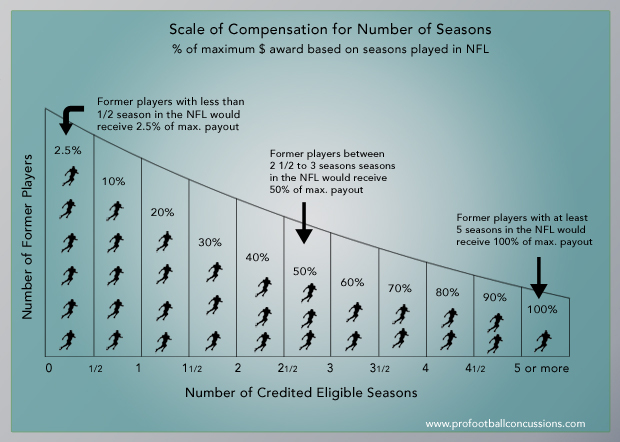 The amount of compensation that an individual player receives will vary based on the diagnosed illness, the age of the player at the time of diagnosis, and the number of seasons played in the NFL. For instance, a player diagnosed with ALS at 42 years old who played 5 seasons in the NFL would be eligible to receive $5 million. However, a former player diagnosed with Alzheimer’s at age 72 who only played 3 seasons in the NFL would receive $190,000. The two charts below show how the compensation is adjusted for illness, age and years played. Even though 3,600 former players are expected to be diagnosed and compensated, the report estimates that the total number of former players with a compensable illness over the life of the settlement will be much higher. Over the 65-year life of the settlement, nearly 5,900 players are expected to be diagnosed with one of the covered illnesses. So, 3,300 former players are expected to be diagnosed with a covered illness, but never receive compensation from this settlement. Why? Either by opting-out of the settlement, failing to register within the initial mandatory 180 day period, or otherwise ignoring the requirements for participation, thousands of former NFL players will give up benefits that are earmarked for them. The report also forecasts that over the lifetime of the plan, 31 players will be diagnosed with ALS (the highest paying illness of the settlement), but 13 of those diagnosed players will not have properly participated in the settlement plan. 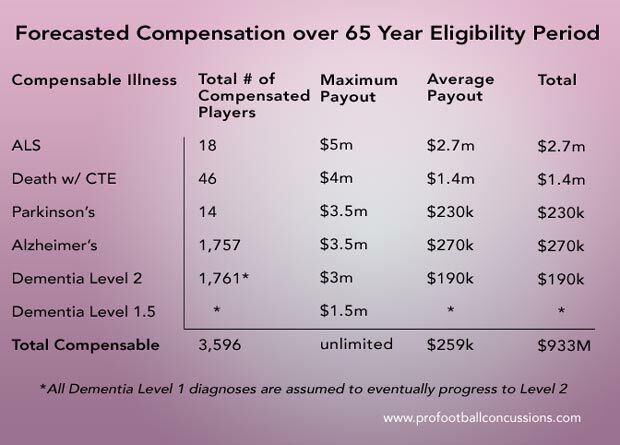 An ALS diagnosis adjusted for age and seasons played (as little as 1/2 NFL season) pays in a range of $7,500 to $5 million. Of the 21,000 former players estimated to be in the class, only 4,207 (or 20%) filed a claim against the NFL. That is, 4,207 players are represented by lawyers in the concussion litigation. That leaves as many as 16,000 former players without legal counsel as the proposed settlement heads toward final approval. Although an attorney would get a percentage of a client’s settlement compensation, understanding and navigating through the terms of the settlement without counsel is a daunting proposition. Of the 2,300 players expected to be diagnosed at some point during the qualifying settlement period, but not receive any compensation, it’s likely that the bulk of them never consulted an attorney familiar with the concussion litigation and subsequent settlement. Surprisingly, families for 21 of 46 deceased players diagnosed with CTE (post-mortem) never filed a concussion lawsuit against the NFL, including 2 former players who’s families will be eligible to receive the maximum CTE payout of $4 million dollars. To be one of the 46 deceased players who were diagnosed with CTE, a player or his family must have given permission for a pathologist to examine his brain upon death. There is a mandatory 180-day settlement registration period that begins upon final approval of the settlement by the court. All former players (even if currently healthy) must register during this initial period if they are ever to receive compensation. Even though they are included in the class of former players (estimated at 21,000 players), any former player who fails to register will be forever barred from receiving any compensation from this settlement, regardless of illness or injury. Because the NFL has agreed to uncap on the total amount of compensation available to fund the settlement, there is no reason for any player who does not choose to opt-out of the settlement to not register to be part of the settlement. Some players may choose to opt out to preserve their right to sue the NFL independently on the same issue. But to not opt-out and then also fail to register within the mandatory 180 days would eliminate a player’s rights to ever sue based on head injuries and also bar the player from ever receiving compensation from the settlement. That would be bad.